The incidence of thyroid cancer has been rising steadily in the United States and around the world, but the reason does not seem to be an inherent rise in thyroid cancer incidence, but rather the increased detection of thyroid cancer. Here to tell us about detecting indolent thyroid cancer and the pros and cons of active surveillance is Dr. Lewis D. Hahn and Dr. Terry S. Desser, authors of a study published in Cancers of the Head & Neck. 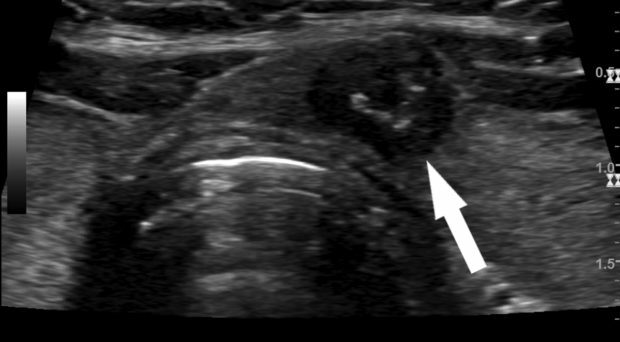 A typical example of a small papillary thyroid carcinoma in the thyroid gland as seen on ultrasound (arrow). Improvements in imaging technology have made it possible to detect and successfully diagnose thyroid cancers that are less than a centimeter in size. A combination of these improvements with increased utilization of imaging has led to identification of many more cancers in their earliest stages of development. This might initially seem like a good thing, but unfortunately most of the thyroid cancers that have been detected in recent years are tumors that would not have significantly affected a patient’s life span, and in many cases would have gone completely unnoticed; such cancers are called indolent. We are experiencing an “epidemic” of indolent thyroid cancer, creating a pressing need to better identify and manage this disease. For these patients, treatment (usually a combination of surgery and radiation therapy) would cause more harm than good. Given that increased detection of these lesions has shown no sign of subsiding, we wrote a review to specifically discuss what is known about distinguishing indolent thyroid cancer from more aggressive forms. In a sense, we are experiencing an “epidemic” of indolent thyroid cancer, creating a pressing need to better identify and manage this disease. It would be ideal to identify those thyroid cancers destined for indolent behavior when they are initially diagnosed. Nearly all thyroid nodules that come to clinical attention undergo ultrasound, and therefore we looked into whether any studies have identified the appearances of nodules on ultrasound which predict indolent behavior. Overall, the answer was no: most studies have been focused on the simple binary distinction of nodules that are suspicious for malignancy versus those that are benign. Part of the reason that data is sparse is that very few thyroid cancers have actually been observed without treatment for long periods of time, making correlation of sonographic features with indolent behavior difficult. Several studies performed in Japan have begun to investigate these questions, but none have definitively determined sonographic features that predict indolent behavior. Similarly, molecular features of thyroid cancer with indolent behavior have not been elucidated. Existing studies have focused on identifying genetic mutations that predispose cancers to aggressive behavior, but few have investigated the complementary question of what features define indolence. What is the impact on quality of life if a patient is told that he or she has a cancer that will not be treated? While much work remains to be done to identify indolent thyroid cancer, it turns out that there is one fairly reliable feature, which is size: most cancers that are less than a centimeter in diameter are indolent, and some groups have advocated active surveillance for these lesions rather than immediate treatment as long as there is no evidence of cancer spread beyond the thyroid. Nevertheless, the management option of active surveillance raises its own set of questions: is it more cost-effective to undergo years of surveillance or simply have a surgery performed? More importantly, what is the impact on quality of life if a patient is told that he or she has a cancer that will not be treated? We discuss early studies that have begun to address these questions; however, the management of these lesions will need to further evolve as we improve our ability to predict which cancers are indolent. Clearly there is much to still be discovered regarding indolent thyroid cancer. We invite you to read our review on this challenging and seemingly ubiquitous entity. Dr. Hahn (pictured) is a third year Radiology resident, and Dr. Desser is a Professor of Radiology, at the Stanford University Hospital and Clinics. Dr Desser is the author of over 70 peer-reviewed publications and is a member of the American College of Radiology’s Thyroid Imaging, Reporting, and Data System (TI-RADS).